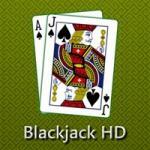 Blackjack actually refers to a specific holding (two cards totaling 21). However, this is also the most common term for the game – also known as 21. You are playing against the dealer at all times. Many people feel that you must play differently depending on where you sit at the table. This is not true. Players sit in a semi-circle around the dealer, but no matter where you sit, you are still playing against the dealer. You owe nothing to the other players – it is your own money you are risking. In Blackjack, the suits of the cards have no significance. Tens, jacks, queens, and kings all count 10. An ace counts 1 or 10 at the player’s option. Cards from 2 to 9 have their face value. Therefore, if you hold a nine and a five, you have 14. A nine and an ace can be either 10 or 20. 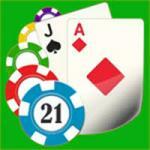 The simple idea of the game is to get closer to 21 without going over than the dealer does. You are dealt two cards and the dealer is dealt two cards also – one always face up, and one face down. You are then given the option of standing with the cards you have (“stick” or “sticking”) or you may be “hit” and be given another card (“hitting”). You may take as many cards as you wish to, but should you go over 21, you “bust” and the dealer wins automatically. The dealer will not take any cards until all players are through at taking cards. Thus the dealer’s biggest advantage is here. 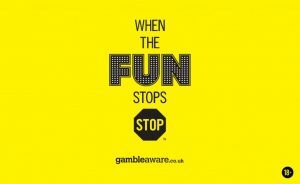 Any players that bust lose their bet – even if the dealer goes bust. If you stay at 21 or under and have a higher total than the dealer, you win; if both you and the dealer hold cards equaling the same total, it is a “push” and you stay even (not winning or losing). If the dealer has a higher total without busting, he wins. The pay off if you win is even money (one to one). If you get a “21” or “Blackjack” (21 in two cards) you are paid at a rate of 3 to 2 (bet $10 win $15). If the dealer gets blackjack at the same time, you push – all other players lose. You may take “Insurance” when the dealer’s first card is an ace. After all players and the dealer have two cards, he will ask “Insurance?” You may bet another 1/2 of your original bet. Payment is 2 to 1 if the dealer does get blackjack. At this point, after each player and the dealer have 2 cards, he will start at the immediate right and see if the player wants a card (a “hit”). If yes, the player scratches the table with his fingers or cards towards himself. If not, he places his cards under his bet or makes a negative movement with his hand. Dealers respond to hand gestures only. If you go over 21 “bust” you turn your cards over (face up) and the dealer takes the cards and your bet. If you stay at 21 or under, the dealer will continue to the next player. As we mentioned, an ace can be counted as a 1 or 11. When you have say an 8 and a 10, you have a “hard” hand. However, an 8 and an ace gives you a “soft” hand. Because you have a soft 19 or a hard 9 if you count the ace as a one. – Always hit when you have 11 or less. – Always stand with a hard 17 or more. On a hard hand: When the dealer’s up card is from 7 to Ace, draw if you have 12 to 16. When the dealer’s card is 2 to 6, stand on 12 to 16 except if the dealer’s card is a 2 or 3, in which case you would draw. On a hard hand: Always double with 11, with 10 except if the dealer has a 10 or ace, with 9 against the dealer’s 2 to 6 up card. 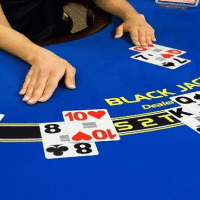 On a soft hand: With ace 2 to ace 7 double against dealer’s 4, 5, or 6. Also with ace 6 against 2 or 3 and ace 7 against 3. Always split ace-ace, and 8-8. Never split 10-10, 5-5, or 4-4. Split other pairs only when the dealer’s card is 2 to 6. These rules may seem complicated and difficult. However, after playing at home, this basic strategy will require no concentration.